Robin Snodgrass is co-owner of Allure Salon and Spa. As a Master Stylist, she has over twenty-five years in the hair industry. She is a certified color specialist trained through Goldwell of New England and has taken numerous color classes through Redken, Framsi, Rusk and Schwarzkopf Color. 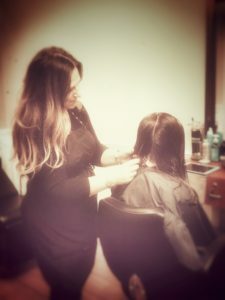 She has extensive knowledge of many hair color lines and can seamlessly move any client into the Redken color system, which is currently being used at Allure. (For more information about Redken Color click here.) She excels in Color Corrections, beautiful rich classic colors, Highlights, Low Lights as well as Balayage, Ombre and Hair Painting. In addition to her expertise with hair color, she creates custom haircuts to suit her clients needs and desires. Robin feels that all women have their own individual beauty. When creating a new look for a client, she works closely with them to create a custom look which captures a balance between current trends and classic looks. She aims to highlight their own individual beauty. Robin has attended countless color technique, cutting and highlighting classes, seminars and hair shows throughout her 25 plus years in the hairstyling industry. She will be heading to New York City to the Redken Color Institute where she will further her creativity in hair coloring. You will find Robin at Allure most days working with clients or working on an up and coming project/event for the salon. When you come to Allure, you are greeted with her warm and welcoming smile as she is never too busy to say hello, grab a coffee or tea for all the clients that walk through Allure’s door. In addition to her time in the salon, she enjoys spending time with her son, family, friends and her beloved Great Dane. She loves to be outdoors walking, running or just hanging out. Additionally, Robin has a bachelors degree in Social Work and is obsessed with learning new things. She finds much of her inspiration through music and art.